Police in the city of Dera Ismail Khan in Pakistan’s province of Khyber Pakhtunkhwa (KP) filed cases against two journalists from South Waziristan on December 8 for covering protest rally of Pashtun Tahafuz Movement (PTM). PTM is a social movement that has been protesting denial of civil and political rights for the ethnic Pakhtuns in Pakistan. The movement is led by Manzoor Ahmad Pashteen, an activist from South Waziristan. Javed Khan, Station House Officer (SHO) lodged criminal complaint known as First Information Report (FIR) against 30 people, who participated in the PTM rally as well as the two journalists who claimed to be just covering the rally. The journalists Sailaab Mehsud of Radio Free Europe/ Radio Liberty’s Mashaal Radio and Zafar Wazir of local Khyber TV, were booked for raising slogans against state institutions and inciting the public to violence. PTM had organized the rally to protest the imprisonment of their leader Arif Wazeer and two otherPTM members for two years in D.I. Khan Jail. On December 12, a meeting of tribal journalists was organized in which a committee of six journalists headed by Awardeen Mehsud, President of Tank Press Club was formed to look into this matter. The journalists in the meeting demanded the immediate withdrawal of cases against journalists. Local press clubs including the Wana Press Club, Tank Press Club, Makeen Press Club, Jandola Press Club and Masood Press Club, Tank participated in the meeting. Talking to Pakistan Press Foundation (PPF) Sailaab Mehsud said they were at the rally only for the coverage of the event where they also conducted interviews with protestors about the imprisonment of PTM leader and activists. 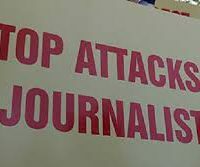 Speaking to PPF, Secretary General of Wanna Press Club, Aala Khan and Senior Vice-President of Pakistan Federal Union of Journalists (PFUJ) Shamim Shahid, condemned the incident and demanded the withdrawal of cases against the two journalists.